The clock's ticking and this time there may be no mercy. 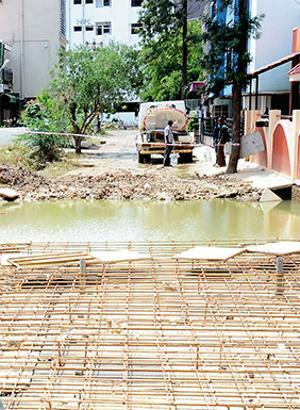 Property owners of apartments built upon storm water drain (SWD, or raja kaluve) may soon face action. Officials on Friday identified six 'illegal' properties built on the drain corridor in Kodichikkanahalli. This encroachment is believed to be the root cause of last week's flooding. On Friday morning, a team of officials from the Bangalore Metropolitan Task Force (BMTF) set out for a spot inspection in Kodichikkanahalli, carrying with them the map that marked the original positions of storm water drains in the area, and also the latest Google images, to compare. This gave the surveyors a clear understanding of the encroached parts of the drain network. The map showed that the SWD network was supposed to pass via Kodichikkanahalli and empty out into the Madivala lake. However, at points along this network, the SWD disappeared altogether - in its place were multi-storeyed apartment buildings that were clearly cutting off drainage. The SWD network is supposed to connect the city's lakes and carry excess rainwater out. The recent inundation of areas surrounding water bodies was the result of this network being cut off, mainly due to illegal constructions, say experts. Mirror had recently reported on July 30 ('Marooned in the mess of their own making) how the breach of the Halimavu lake affected more than 2 lakh people residing in and around Duo enclave, Anugraha layout, Ramanashree enclave, Kodichikknahalli, Doctors layout, Seenappa layout and surrounding areas. Comparing the 'before and after' documents, the officials were able to confirm the apartments that were major encroachers of the drain. Interestingly, these 'illegal' properties were built with a bank loan, and an approved building plan from the civic agency and the owners have been paying property tax too. The BMTF officials were planning to register FIRs against the owner/developer of the six apartments they identified. But in a final round of meeting with the BBMP, it was decided that there would be a re-survey before zeroing in on the next course of action. Apartments that face action include those built on survey numbers 6, 8, 10, 16 and 17 of Kodichikkanahalli village. Each apartment complex has units between 500 and 1,000 scaling up to ground plus five floors. As per the Karnataka Municipal Corporation Act, any structure that encroaches upon an SWD can be demolished without issuing a prior notice to the property owner. "We took the drain map and the latest Google images and superimposed the two. The illegally urbanized areas were visible and we could easily identify the encroachments along the drain network. To start with, we have identified six apartments built on the drain and FIRs were being readied against the builders," a senior official in charge of the inspection told Bangalore Mirror. However, after consulting the BBMP joint commissioner (east) and the BMTF chief, additional director general of police T Suneel Kumar decided to commission a re-survey of the drain and the properties. The exercise will begin on Saturday from the Madivala point. According to the law and also the latest National Green Tribunal, an SWD in Bengaluru has a buffer zone of 50 m. For secondary drains, it is 35 m and 15 m for tertiary drains. The buffer zone is the distance from a storm water drain in which no construction is allowed.